It’s a very good thing that Transat has put a major focus on cost-cutting in the past few years, as it seems to be getting more and more difficult to earn profit in the current environment. The integrated tourism company saw its Q1 revenues drop 5% to $689.3 million for the quarter ended 31JAN, while recording an adjusted operating loss of $37.1 million, versus $31.7 million in 2016. "Our organization's performance is much better, given that our cost-reduction and margin-improvement initiatives resulted in an improvement of $75 million last year compared to 2014, and we are expecting to reach $100 million this year," said President & CEO Jean-Marc Eustache. Eustache does see the possibility for improvement in the second quarter. ”Considering, however, that the results from the second quarter last winter were affected by multiple adverse events, it is likely that our second-quarter results this year will show a slight improvement over 2016." Transat attributed the Q1 revenue drop to a decline of 3.5% in the number of passengers on the Sun destinations market, due to a decision to reduce its product supply by 5.2% in Q1. The decrease also resulted from a higher proportion of flights sold without a land portion versus all-inclusive packages compared with 2016. 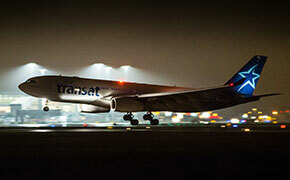 On the transatlantic market, Transat reported that product supply increased by 10.1%, which resulted in an increase of 4.4% in the number of travellers. Average selling prices were higher on the Sun destinations market, lower on transatlantic. Ocean Hotels, 35% owned by Transat, contributed $3.6 million to the quarterly results, compared with $1.9 million in 2016. As announced in December, Transat is still assessing the opportunity of either acquire the entirety of Ocean Hotels, or sell the 35% it currently owns, with a view to reinvest in another hotel project. The company says a decision on this topic will be made in the coming months. Transat does have significant cash reserves it could use for investment. As of 31JAN, free cash totalled $454.8 million, compared with $427.5 million at the same date in 2016. Look for more Transat coverage on Open Jaw tomorrow following today’s earnings call with financial analysts.